Select menu Window => Live if you are not already in the Live Window. Select "Chord recognition method" is "Full fingered" and press Exit. When a MIDI keyboard controller is attached then play a 3 finger chord with all keys left of the middle C, e.g. c-e-g for a C chord. The accompaniment will start to play. Now play different chords all starting just after the beat. You will notice that the accompaniment has to stop all the notes that where playing at the beat and start playing them at the new chord. That doesn't sound good. Try to play the chords just before the beat. OMB will then delay the chord change to occur exactly on the beat. That will sound much better. Beside the accompaniment, you can also choose to let the keys in the chord area play an instrument. Click on "Left on/off: or press the ";" key. Now the keys in the chord area will play an instrument sound when pressed. Repeat the actions to switch "left hand off" again. In a 61 keys keyboard, the left 24 keys are for the chords and the 37 keys on the right are for the melody, but you can change that. Change "Highest chord key" from B4 to B3 and press Exit. You will notice that now the 49 keys on the right produce melody sound and only 12 keys on the left are available for chords. To play a G chord you now can't play g-b-d, but you must hit b-d-g. If you are used to playing chords within a 12 key area, you will have 12 keys extra available for melody. If you don't want to play chords this way then set the "Highest chord key" back to b4. If you have 2 MIDI keyboard controllers available, then you can use one for the chords and one for the melody. Check on which channel the notes are that the chords-keyboard send and fill that in the "Chord channel" in the Preferences window, Live control. You will see that the "Highest chord key" now fades, it has no function anymore. All key on the chords-keyboard will now be handled as chords and all keys on the melody-keyboard will be handled as melody. Be sure that the melody-keyboard sends it notes on a different channel then the "Chord channel". Select "Chord recognition method" is "Single finger (Yamaha)" and press Exit. You can now play a chord by pressing just one key, for the C chord press a c key. Only the major chords can be played with one key, for minor chords an extra key must be pressed and for more complicated chords even 2 extra keys. Which extra key must be pressed, is different for the Yamaha and the Roland method. Each method is supported in One Man Band but it is not recommended to play this way. You will know how it works if you already learned to play this way. If you didn't learn to play chords yet then it is advised to learn to play Full fingered chords, as described above. Select "Chord recognition method" is "Fingered on bass" and press Exit. Press c-e-g in the chord area of your keyboard. The accompaniment will start to play. Now press e-g-c. You will notice that this sounds different. You now hear a bass note that is different from the root note of the chord. In songbooks this is presented as a slash chord. E.g C/E indicates a C chord with an E bass note. If you press a chord in "Fingered on bass" mode then the lowest key will be the bass note. So pressing C-E-G will give a C chord, E-G-C will give a C/E and G-C-E will give a C/G. In "Full fingered" mode all this would sound as the same C chord. Select "Chord recognition method" is "Full keyboard" and press Exit. You will notice that you can now play melody on all the keys of your keyboard, there is no separate chord and melody area on the keyboard. Whenever you have 3 or more keys pressed then One Man Band will try to detect a chord. All chord types can be played. Only groups of notes that are close together will be recognized. Go to the Preferences window and select the Live Control tab. Select "Chord recognition method" is "Guitar" and press Exit. Just like in "Full keyboard" there is no distinctive chord area and melody area. What is different now is that only basic major and minor chords (e.g. C and Cm) are recognised, and that there is no limit on how far the chord keys are apart. This mode is usefull for MIDI guitars but you may also prefer to play the keyboard this way. You can use a sustain pedal for chord fixation. Go to the Live Control tab of the preference window and change the "Fixation pedal" to 64, then press exit. Now the chords you play will have no effect on the accompaniment as long as the sustain pedal is down. This is a way to prevent unwanted chord changes. Select "Chord recognition method" is "Free form" and press Exit. Like in "Full fingered" mode there is a separate chord area on the left and and a melody area on the right. But now you are not restricted to existing chords. Any combination of 3 or 4 keys will be used to play the accompaniment. All bass notes will be played with the root note, defined by the lowest key. E.g. if you play c-c#-d then that is what you get for accompaniment, who are we to judge your musical taste? To play chords with a set of MIDI bass pedals choose single fingered (Yamaha) mode and assign the "minor pedal" function (Preferences - Live control) to the highest C key of the MIDI pedals. Program your MIDI pedals to send notes below the range of your keyboard. Assign the chord area to the range of the MIDI pedals. In stead of using the high C of the MIDI pedals you can also assign the minor key to a sustain pedal or something else. When you press a bass pedal then a major chord will be activated. But if you press the minor pedal then the text "MINOR" will appear in the chord display. This means that the next bass pedal pressed will be a minor chord. You will have to repeat the minor pedal before each chord. If you pressed it unintended then you can press it again to correct it. In MIDI accordions the chord buttons produce full fingered chord notes on a channel different from the channel used by the melody keys. Define this "Chord channel" in the Preferences window and there will be no problem with an overlapping chord and melody area. In full fingered mode the right size of the keyboard is used to play the melody. Depending on the multivoice selected, it will sound with layered instruments. There may also be harmonies added that match the chord that is currently playing in the accompaniment. Click on the screen to select the multivoice "Piano" or press the "5" key on your PC keyboard. Play some melody, you will hear only single piano notes. Now click on "Organ guitar" or press the "6" key. Now harmonies are added while playing melody. Notice how the harmony notes, of a continuous playing melody key, change as you play different chords. You can split the melody area of the keyboard into areas for 2 different instruments. First you need a multivoice where such an extra instrument is defined. Select menu Window => Multi-Voices. In the list of voices, select the first occurrence of "ZZZ empty". Change the name from "ZZZ empty to"Piano Trumpet" In the box "Channel for voice 4", click on the instument name "GrandPno" and select "56 - Trumpet". Change "Octave" to -2. Click on the "Bass/Split" option. You have created a new multivoice with an extra instrument that can be used in a keyboard split. Now go back to the live window, you will see the voice "Piano Trumpet" in the upper left corner, because you selected it in the Multivoices window. Change "Keyboard split" to C7 and press Exit. Now the lower keys in the melody area will play the piano and the higher keys in the melody will play the trumpet. Now change the "Keyboard split" the Preference window to B3. Change the Octave for the Trumpet in the Multivoices window to +2. Now only the 12 keys on the left of the melody area are available for chord recognition. The keys on the left of the chord area now play the trumpet. A split keyboard keyboard below the chord area may be usefull if you have a piano with 88 keys at your disposal. If you have a set of MIDI pedals and want to use that for playing the bass then go to the Preferences window and select the Live Control tab. 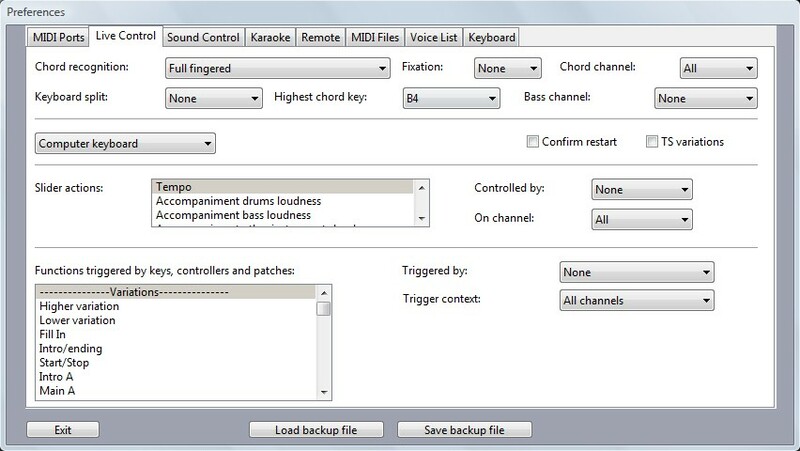 Select the "Bass channel:" value that corresponds with the MIDI channel that your set of MIDI pedals is sending on. Make sure it is not the same as the channel that your keyboard is playing on. If it is then you must change the channel of either the set of MIDI pedals or the MIDI keyboard. The Midi pedals will now play the instrument that is defined in the Multivoices window as bass/split. By default none of the multivoices have a bass/split defined so you have to change some of them yourself as described in the previous topic. After all these experiments, don't forget to put the settings back to normal as shown below. Unless you are sure you want to keep them as you changed them.